LG BD390 review | What Hi-Fi? The BD390 includes both wireless internet access and a built-in 1GB memory: for now, only Sony's games-orientated PS3 is similarly endowed. As a result, loading times are super fast with even the most feature-laden discs, while exploiting BD-Live features is a snap. Other BD players can be brought to this specification relatively painlessly, either by adding Ethernet kit, memory stick or both. The LG's allure is that it does everything it should out of the box. And the benefits extend beyond enhanced interactivity. 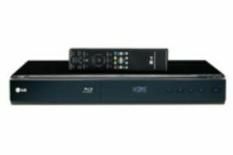 The BD390 is also DLNA compliant, so it's able to replay a variety of different digital file types (such as DivX) over your network. It'll also stream video files from YouTube, and accessing all forms of media is straightforward, thanks to clear on-screen graphics and a prosaic but effective remote control. LG BD390s sold in the USA also support instant movie streaming from the US service Netflix. LG's deadly rival Samsung has recently announced iPlayer and LoveFilm support for its next wave of Blu-ray kit, so it'll be interesting to see if LG chooses to expand the flexibility of UK-spec 'BD390s. We'll ask: keep an eye on whathifi.com for a reply. Even if that doesn't happen, the LG's strengths are considerable. Picture quality is excellent. The BD390's combination of smooth, low-noise backgrounds and crisply relayed details ensures even noisier transfers such as The Hurt Locker are inviting. It's not quite as eye-poppingly sharp as some of its peers, such as the Sony BDP-S560, but more natural colours, denser blacks and equally composed motion handling give it a decisive edge. It's even a sturdily assured upscaler of standard-definition DVDs. Sonically, the BD390 simply knocks the competition out of the park. Via its HDMI output sound is gutsy, controlled at the top end, forceful low down and always involving, while the LG's combination of 7.1-channel analogue outputs (rare at this price) and sensible speaker-level adjustability (rarer still) make it a worthy upgrade for older AV amplifiers. The brilliant LG BD390 only serves to add even more momentum to the theory that LG is really hitting its stride of late. Shame we had to wait so long to get hold of one, but it was worth it.